Manage passwords, documents and other confidential data from one source! 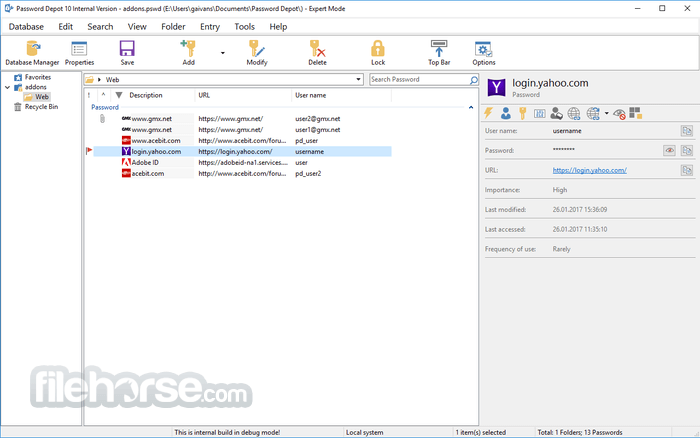 Password Depot is a powerful and very user-friendly password manager for PC which helps to organize all of your passwords – but also, for instance, information from your credit cards or software licenses. The software provides security for your passwords – in three respects: It safely stores your passwords, guarantees a secure data use and helps you to create secure passwords. However, Password Depot does not only guarantee security: It also stand for convenient use, high customizability, marked flexibility in terms of interaction with other devices and, last but not least, extreme functional versatility. Find all the password-protected or encrypted files on a PC or over the network! BEST POSSIBLE ENCRYPTION. In Password Depot, your information is encrypted not merely once but in fact twice, thanks to the algorithm AES or Rijndael 256. In the US, this algorithm is approved for state documents of utmost secrecy! BACKUP COPIES. Password Depot generates backup copies of your passwords files. The backups may be stored optionally on FTP servers on the Internet (also via SFTP) or on external hard drives. You can individually define the time interval between the backup copies’ creation. PROTECTION FROM KEYLOGGING. All password fields within the program are internally protected against different types of interception of keystrokes (Key Logging). This disables that your sensible data entries can be spied out. VIRTUAL KEYBOARD. The ultimate protection against keylogging. With this tool you can enter your master password or other confidential information without even touching the keyboard. Password Depot does not simulate keystrokes but instead uses an internal cache, so that they can neither be intercepted software- nor hardware-based. FAKE MOUSE CURSORS. Typing, using the program’s virtual keyboard, you can also set the program to show multiple fake mouse cursors instead of your usual single cursor. This additionally makes it impossible to discern your keyboard activities. UNCRACKABLE PASSWORDS. The integrated Password Generator creates virtually uncrackable passwords for you. Thus in future, you will not have to use passwords such as “sweetheart” anymore, a password that may be cracked within minutes, but e.g. "g\/:1bmVuz/z7ewß5T$x_sb}@<i". Even the latest PCs can take a millenium to crack this password! FILE ATTACHMENTS. You may add file attachments containing e.g. additional information to your password entries. These attachments can be opened directly from within Password Depot and may additionally be saved on data storage media. TRANSFER PASSWORDS. You can import both password entries from other password managers into Password Depot as well as export entries from Password Depot. To do so the software offers you special wizards that facilitate importing and exporting password information. USER-FRIENDLY INTERFACE. Password Depot’s user interface is similar to that of Windows Explorer. This allows you to effectively navigate through your password lists and to quickly find any password you happen to be searching for. CUSTOM BROWSERS. You can determine yourself which browsers you would like to use within the program. This way, you are not bound to common browsers such as Firefox or Internet Explorer but can also use Opera, for example. INDIVIDUAL USER MODES. As a new user, you can work with only a few functions in the Beginner Mode, whereas as an expert you can use all functions in the Expert Mode or can outline your own demands in the Custom Mode. ENTERPRISE SERVER. Password Depot features a separate server model enabling several users to access the same passwords simultaneously. Accessing password files may run either via a local network or via the Internet. USB STICK. You can copy both your password files and the program Password Depot itself onto a USB stick. In this way, you can carry the files and the software along wherever you go, always having them available to use. CLOUD DEVICES. Password Depot supports web services, among them GoogleDrive, OneDrive, Dropbox and Box. In this way, Password Depot enables you to quickly and easily enter the Cloud! Note: After 30 days trial, the program will run in freeware DEMO mode.